So, the other night when the boy took me to the rather lovely, hidden-away gem that is Daphne, a Greek restaurant on Bayham Street in Camden, and the waiter hurried over with an over-flowing plate of garlicky lemon olives, I knew I was in for a treat. 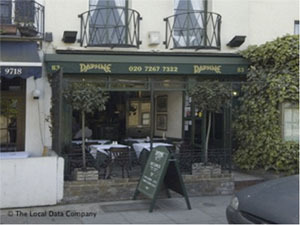 Daphne is your quintessential quaint restaurant – it’s not got a website, it’s not on the high street, and it doesn’t have decor that makes you feel like you’re living in 2011 (the green, flowered booth cushions were akin to the wallpaper in my childhood bathroom circa the 1980s). It does have fantastic waiters, cozy dim lighting, great wine and even better food. Unassuming from the outside, but a treat inside! Let me first speak of the service, then we’ll get down to the courses. Being a Canadian for most of my life ingrained me with a sense of service (whether I was working in a restaurant or eating there). Now, no offense to the lovely Brits, but it’s always a bit lacking in this country. Which is probably why people don’t tip. Or maybe it’s the other way around. But at Daphne’s there wasn’t any hesitation that we were going to be treated like family. Outside of the almost instantaneous appearance of olives, the waiter also helped us with our wine selection – by letting us try the two bottles we were debating over before we chose. It’s little touches like this that I would think make people come back (a fact I discovered when I overheard two tables talking about other visits they had made to the restaurant). Then came the food choice – there was a large chalkboard (brought to our table and explained in detail) full of specials. But there was also a huge menu, which included the magnificent sounding mezze option. We chose the latter, adding one extra starter because we couldn’t resist the description of halloumi, eggplant and prawn, wrapped up in filo pastry. And boy were we overwhelmed! The cold course included seven plates – silky taramasalata, creamy hummus, mushy aubergine, tasty tahini, rich fish salad, cooling tzatziki and tender beets, with warm pitta. Then the hot course added another four plates to the sum (think: calamari, sausages and more) while the final course was a large platter of various grilled meats and greek salad. Suffice to say, we took a container of leftovers home. All for £17.50 each. This was served with care, in a relaxed manner – the waiters let us pause between courses when we looked like we might explode, and were more than happy for us to take the rest away. The wine – a Greek red from a winery called Ktima Lantides (http://tinyurl.com/5tt6bfc) – was full-bodied, oakey and delicious. And the tables were filled with in-the-know locals, out for a nice comforting Friday night meal. Although this may not have been served in an incredibly fancy, white-tableclothed environ, I would take the hospitality and comfort of Daphne before that any day of the week. Anywhere that thinks to serve their customers so well, and start off with a giant plate of olives, definitely suits Gwiltypleasures just fine!